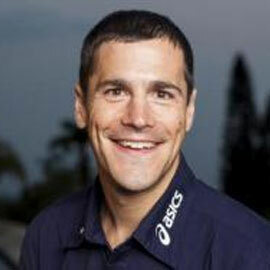 Andy Potts goes through a comprehensive race-day strategy session. Andy covers just about everything that might come up during the swim including assessing course condition, goggle selection, transition setup, position on the start line, mentality of the swim pack, swim exit, getting quickly out of a wetsuit and much more. You'll find pearls of wisdom for triathletes of all levels. After turning professional triathlete in 2003, Andy was named USAT Rookie of the Year. With only eighteen months of triathlon specific training, Andy realized his childhood dream of becoming an Olympian by earning a spot to the 2004 Athens Olympic Games. Since then Andy has been a regular podium presence winning his first World Cup in 2005 and finishing the 2006 season ranked 3rd in the world. In 2007, Andy blew up the triathlon scene by winning the Pan American Games in Rio de Janeiro and followed that impressive performance by winning the Ironman 70.3 World Championship. Consequently, Andy was named USA Triathlon's non-drafting and draft-legal Triathlete of the Year as well as Triathlete Magazine's All-Round Triathlete of the Year. 2008 brought upon new challenges with Ironman racing where Andy continued to impress. In his Ironman debut, Andy finished 7th at the Ironman World Championships. He has since added Ironman Champion to his accolades. Most recently, Andy was the 2014 Escape from Alcatraz Champion.